The Ingenuity Lab wanted an interactive game made from cardboard to show the potential of the materials. This exhibit would be on display during the month of the Cardboard Arcade Ingenuity Lab Challenge to inspire the visitors to think big. 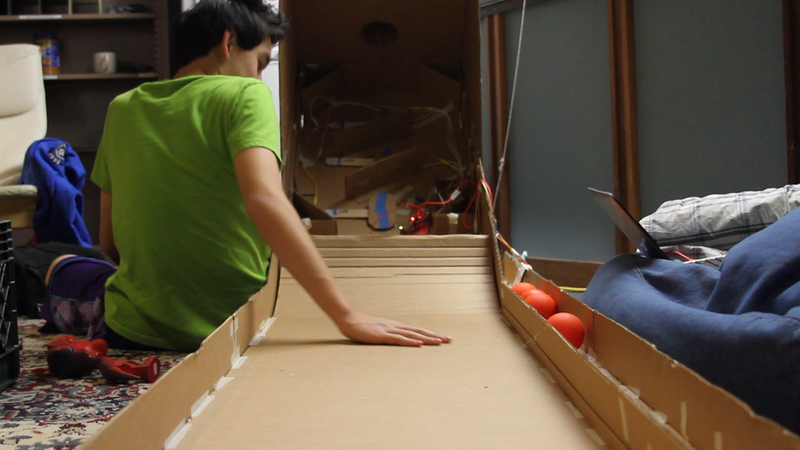 After several working prototypes of different games, we settled on a cardboard skeeball game because the mechanics could be easily replicated by the visitors. Sensors were made from cardboard and foil to detect the balls landing in the different chutes. The same sensors were used to create a ball counter. Coded in Scratch, we programmed a score board and sound effects. The Scratch program was connected to the buttons via a MaKey MaKey. The skeeball machine was very popular with visitors of all ages. Kids were waiting up to 20 minutes for a chance to play. This project inspired the visitors when they built their own cardboard projects in the space. Many visitors used the same sensors to create their own game that contained ball counters. The TechHive teen interns took ownership of this project including doing required repairs, design improvements, and maintenance from high visitor use during the summertime.